Not much time has elapsed since the tragedy in Syria’s Douma, which was the last stronghold of Jaish al-Islam militants. 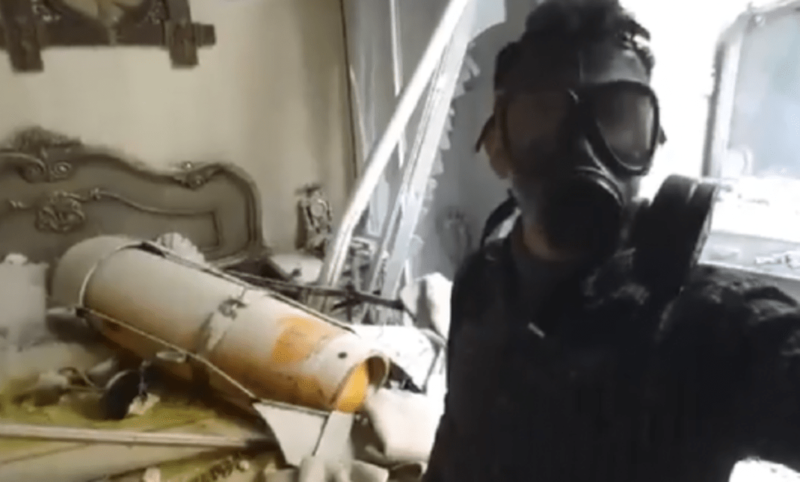 Several videos with the testimony of participants of the so-called chemical attack started to appear on the Internet. Two medics from the hospital of Douma told the truth about the staged video, widely spread by the discredited White Helmets. The participants also say the event in Douma is a provocation. According to the medics, a group of unknown people broke into the hospital, started screaming about the chemical attack, panicked, and then sprayed people with a fire hose. At the same time, eyewitnesses confirmed that the “victims” on the videos had no signs of chemical poisoning. It’s worth noting that the UN and OPCW representatives share the same opinion about the events in Douma, since there is no clear evidence of the use of chemical weapons. In this regard, Inside Syria Media Center decided to conduct its own investigation in order to find out what exactly happened in Douma. Our experts analyzed reports, photos, and videos that appeared on the Internet. First of all, it’s impossible to determine the location of these filmings. They could also have been made in Idlib province, or in any other opposition-controlled areas where the White Helmets were repeatedly caught staging videos. Moreover, the technical video and photos analysis indicates that the performance was prepared well in advance since in most files the metadata is either missing or changed intentionally. It’s also worth noting that the representatives of “civil defense” quickly found themselves next to the “chemical attack,” having had forgotten to put the individual protective gear on. In fact, the concentration of chlorine would cause them to have a strong cough, which was not recorded in any video. Secondly, it seems that the victims in the video have no chlorine poisoning symptoms. Once chlorine contacted human skin it causes blisters and burns. But we don’t see any of these symptoms on victims’ bodies. All the symptoms over the human body occur at the same time after a chemical attack. In the case of a serious chlorine poisoning, there is an uncontrolled muscular contraction of the vocal folds which causes blocking of breathing in, cyanosis (bluish or purplish discoloration of the skin), swelling veins on face and neck, faint, convulsions, urinary and defecation incontinence. With less severe poisoning, there may be oral mucosa and eyes hyperaemia, throat irritation, sneezing, lacrimation, dry eye syndrome, miosis and a strong cough with foamy pink sputum. Meanwhile, in the presented videos we may see some kind of white foam or saliva and no other signs of chlorine poisoning, mentioned above. It is noteworthy that injured children were mainly shown in the video, as is common with the White Helmets. Obviously, this is done to awaken feelings of anger and compassion, or otherwise elicit an irrational emotional response. Thirdly, the video analysis lets us say that “the video’s organizers” simply don’t know the chlorine poisoning symptoms, or how to carry out first aid to the affected. For example, a man (Screenshot 1) is quietly standing and talking to other people in a closed room. After a couple of seconds, he suddenly starts to portray himself as a victim, pouring water on his head. There is a man without any protection next to him. 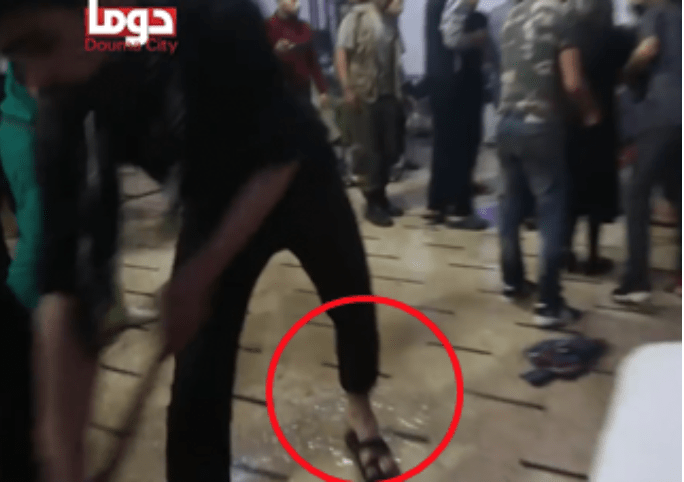 This person is trying to “disinfect” (Screenshot 2) himself and remove “chlorine-contaminated” water from the floor. Meanwhile, for a person who has already been affected by chlorine, it is extremely necessary to provide access to fresh air (take him outside), remove clothes, flush his eyes and nasal cavity, wash mouth with 2% solution of baking soda, give him an alkaline drink (mineral water, milk), carry out inhalation with drinking soda and some mineral water, and finally put olive oil in the eyes. Fourthly, another video shows the place of the alleged bomb site, dropped by the Syrian Air Force. The presented video raises even more questions because everything looks unnatural. How was the air bomb neatly laid on a wooden bed without damaging it? And why wasn’t the bomb, allegedly dropped from an airplane, deformed or damaged in any way after hitting the building? It seems that the bomb (if it really was the bomb and not an oxygen tank) was put there just before the shooting. We have repeatedly witnessed how such yellow cylinders “copy” ammunition with a poisonous substance. We are dealing with another pre-planned operation of the militants, the White Helmets, and their patrons. That is also confirmed by the testimony of doctors from Douma. 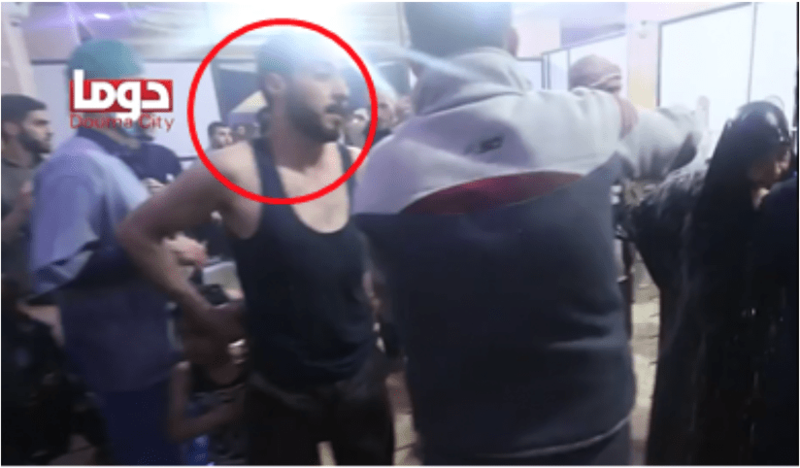 In addition, another fake was held on the anniversary of Khan Shaykhun chemical attack, when Assad was accused of using chemical weapons. But we shouldn’t forget that the chemical weapons in Syria were completely destroyed in 2014 under the international community control.